With all the fun and excitement that surrounds your big day you will be eager to see your wedding photographs, unfortunately it can be frustrating having to wait weeks or even months to get your photographs. However, it can be exciting when your friends and family upload some of the pictures to their social media sites or email them to you. Typically, fifty percent of your guests are likely to have their smartphones with them, Instagram is a quick and easy way to get a variety of images of your big day, and it’s a great way to get your guest be involved. Take full advantage of using Twitter, Facebook and Instagram throughout the day, as it gives people who were unable to make your special day a little sneak-peek into the day and gives you – bride, groom and wedding party something to look at right away when your wonderful day has come to an end. Instagram doesn’t provide users with the easiest way to view posts that you have been tagged in, so creating a specific hashtag (that hasn’t been used before!) is the simplest way to view images only from your day. For example type #lillyandmaxwedding into your tag search on Instagram to view photos from the day. If you are undecided about a wedding hashtag another option is to create a profile that people can follow and this will enable them to tag your wedding in photos. Don’t worry if you already have an Instagram profile, simply log out and create a new account with a name that relates to your wedding day. This way you will always have a place you can go to that is solely for your special day. Another way to incorporate Instagram into your wedding day is to provide your guests with props and backdrops, then get them to take photographs on their smart phones or an iPad, similar to a photo booth. Whether you use the hashtag or decide to upload the photos directly to your wedding profile, it will give your guests something to search for or follow when the celebrations are over. The easiest way to introduce your guests to this idea is by creating a card that can be placed in the invitation along with the other wedding information or placed on the tables at the reception, explaining the concept and also highlighting the selected hashtag and/or profile. I would suggest something like the image below, which is just a sample mock-up of what you could do. Happy Instagraming from all at Rocks Jewellers. At Rocks we love valentines day, it is such a romantic time of year . There are so many things that make this time of year so special and that is why it is the perfect backdrop to ask the special question. Don’t get overwhelmed and carried away in the moment, for any engagement to be perfect it needs some planning. So here at Rocks we have put together some tips to help you with the perfect proposal. We will also point out some possible pitfalls you may encounter and how to avoid them. 1. Tell only those who need to know! First, take advantage of the surprise element that may occur. Tell only those who need to know. Parents would be on the top of the list, however, if there happens to be a chatty mum or dad then tell the other parent. You may even want to show them the ring; they may have some advice for the proposal. 2. Deciding on the perfect Ring. Unless you two have already shopped for engagement rings, you probably are not sure what type ring to pick. If this is the case take a look at her other rings, take her lifestyle and personality in to consideration, and if all else fails fish for some information about what she expects in a perfect ring. Don’t be hurt or upset if she decides to change the ring you have chosen, remember she has to wear it forever. Check with the jeweller that you can exchange the ring before you purchase it. But chances are she’ll keep the ring you chose. 3. Where to propose? If you are a both big family people than you may feel like you need to have them nearby. But remember this is meant to be a special moment for just the two of you. 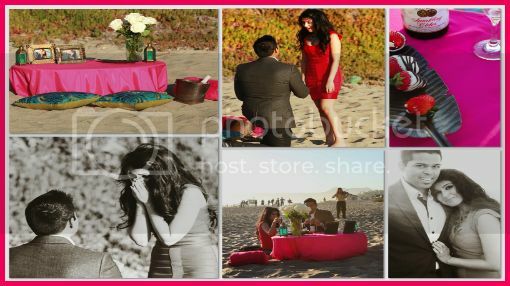 If the beach has been a special place for the two of you then take a walk along the beach and have ‘will you marry me?’ written in the sand. Another option would be in the living room in front of your family and friends and an open fire, where a dinner proposal is also nice and traditional. 4. What to wear. Yes, what you wear matters, as you only get to do this once! And you want her to remember the moment. Depending on where and how you decide to propose a suit adds an extra bit of romance, otherwise you could wear a nice pair of jeans and a shirt. 5. What to say. Think over what to say but do not over rehearse it! Tell her how you feel and what she means to you. And yes, you should say I love you! And say it on one knee! 6. How to say it. If you decide to do something a little different that’s great but remember YOU still have to ask the question. 7. When to say it. Pick a time when you think she is relaxed. When she’s ranting about work is probably is not the right time to ask her to marry you. If she is a morning person, surprise her with breakfast and a ring. Maybe there is a special dinner or party you are attending, on your way out the door tell her that she is missing something, get down on one knee and ask her to marry you…now she has the perfect accessory! 8. Be yourself. Although these suggestions are meant to help, be yourself. She loves you for who you are! 9. Seal the deal with a kiss! We hope this will help you with your perfect proposals! And for that all important engagement ring, take a look at our Rocks Forever Collection.